Esta encantadora casa ofrece todas las comodidades de la vida moderna en un ambiente histórico difusa, es una solución maravillosa para familias que quieren una canica y cómodo hogar en el centro de la ciudad pero al mismo tiempo en una zona tranquila y apacible. El apartamento es muy amplio y luminoso, en la planta baja cuenta con una sala de estar elegante y grande, una cocina moderna muy luminosa y funcional y un elegante baño de lujo. En la primera planta hay un dormitorio precioso y acogedor con una cama king-size, otra habitación con 2 camas individuales que pueden ser atacados como una cama doble y un baño moderno y con estilo. No hay aire acondicionado en la zona de dormitorio y calefacción central para garantizar una estancia confortable. Fuera hay un patio con flores y hortalizas, en el centro encontrará una mesa en la que se recomienda especialmente en el verano para comer en un fondo tranquilo y típico. A 100 metros de la casa que will'be frente a la laguna veneciana, con su riqueza de vida silvestre y especies naturales, viendo las muchas islas y 'barene' de la laguna típica sinuosa, zona de reproducción para cientos de especies de aves. 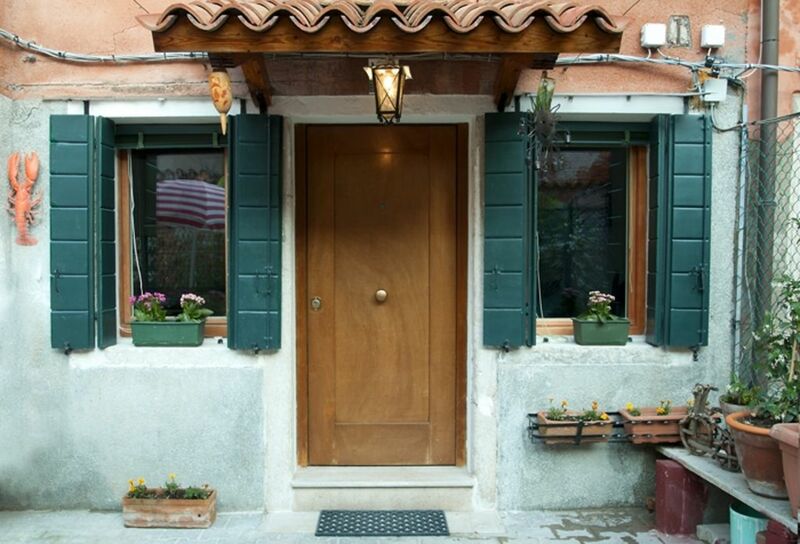 What a lovely apartment, located in a quiet section of Cannaregio - remote, yet close to everything. We spent 3 wonderful days with our 2 granddaughters, and are looking forward to our return in May, when we'll spend another 6 days, just the two of us. Thank you Rita, and Elena for making us feel very welcome... Grazie, e a presto! nous étions deux couples et nous avons aprécié l'accueil avec les bons conseils. La maison était propre, confortable, bien chauffée. Elle a été aménagé avec gout et offrant une ambiance de convivialité. A conseiller pour des amis. è stato un piacere avervi come nostri ospiti. grazie Maria Candida per la sua recensione. E' stato davvero un piacere ospitarvi nella nostra casa. Tucked away and quiet. A well appointed and property of good size for four people. A very well appointed and good sized house that was ideal for 4 persons. The additional bathroom was a great advantage and it was nice to be able to enjoy the outside courtyard, especially as the weather was so warm. On the whole a good location for our group as we like to be away from the crowded areas and prefer to keep to the quieter Fordamentas but at the same have benefit of outside cafe/bars/restaurants in our locality but also within easy walking distance. A socket cover in the kitchen was taped t the wall and the bare wires accessible and visible ( a danger if a child was in occupation. Broken window latches in both bedrooms, one not working the other not lockable. Light switch in kitchen not working, causing a sizzling noise when switched on/off. Bedside light near window in large bedroom, bulb broken (taken out and disposed off during our visit by us). Bare wires are hanging out of wall in utility area. Peeling paint work above the shower in bathroom downstairs. Only 4 mugs for coffee/tea, one has cracked handle! Shower head in downstairs bathroom slides down, fixing bracket loose. Garden chairs, two have cracked backs, one unusable so leaving just 2 decent usable chairs. Kitchen needs some heat resistant table mats and scissors. We cooked in for 6 of our 7 nights and coped ok but were careful to use the bread board to place a hot dish/pan on to avoid damage to the work surface or table cloth, others may not be so careful. These are minor issues so should be fixed with ease but the electric socket cover is a health and safety issue is in need of urgent attention. These issues would not deter us from using the house again and we were made very welcome by Agata who greeted us off the Alilaguna upon our arrival and gave us detailed information about the property and had extensive knowledge of Venice that she was able to inform us about in order to make our stay enjoyable. Sweet little house in the best sesstiere! All what you need: 2 modern bathrooms, nice little kitchen, 2 bedrooms... And I’m the best sesstiere to live during a stay in Venice! We enjoyed our stay! Wir können dieses hübsche Ferienhaus sehr empfehlen. Das Haus liegt in einem touristisch noch ziemlich unentdeckten Teil von Venedig. Es ist geräumig und sehr ruhig gelegen. Komfortabel sind die beiden geräumigen Bäder, äußerst gemütlich ist das Wohnzimmer, und um den großen Esstisch in der Küche können sich alle versammeln. Eine schöne Ergänzung wären eine Spülmaschine und ein paar zusätzliche Kaffeebecher. Die Schlafzimmer sind ebenfalls recht groß und bieten viel Stauraum. Die beiden Einzelbetten fanden wir ein bisschen zu klein. Etwas Besonderes in Venedig ist der Garten vor dem Haus, in dem man frühstücken und relaxen kann. Wir haben uns jedenfalls sehr wohl gefühlt und danken den freundlichen und flexiblen Gastgebern, die auf alle unsere Fragen und Wünsche eingingen. El hotel está ubicado en el barrio 'Cannaregio', unos pasos del barrio judío, donde nunca hay un momento aburrido, gracias a su mercado, taller de artesanía, clubes de remo y Casino, mientras que la relajación viene en los parques sombreados y cafés tranquilos y bares que bordean el laberinto de canales de back-calle. Estará a sólo 5 minutos de distancia de las rutas turísticas, tiendas, restaurantes, 2 minutos del "vaporetto" (autobús barco) detener y 10 minutos de la estación de tren. Cannaregio es el epítome de la vida real en Venecia!